These partitions offer secure division of space, while allowing unobstructed flow of light and air. 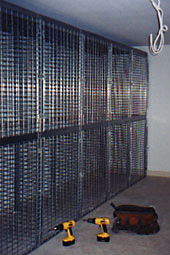 Wire mesh partitions are available in welded or woven wire mesh. Available in 6, 8 or 10 gauge steel, and in powdercoat paint and galvanized finishes. Used in data centers, warehouse/distribution facilities, laboratories, public safety facilities, manufacturing, and wherever security and safety are required. Let us find the best product to suit your needs. Folding Guard manufactures welded wire and woven wire panels designed to provide safety and security for your products and personnel. They are useful for tool cribs, security storage cages, tenant lockers, and other applications. An all-steel, modular perimeter system that can be configured to protect your automated machinery and your employees or visitors. These bracket systems for the Saf-T-Fence line feature quick-release locks for easy panel installation. Galvanized wire partitions that offer a secure way to separate spaces. Qwik-Fence® Welded Wire Partitions is an extremely tough, but attractive, system for separating and securing any space. Quality construction – partition panels, posts, and doors are all-steel and completely galvanized for long-lasting performance and appearance. Open welded wire mesh design provides an unobstructed view and allows air circulation and light penetration while providing security. Easily installation – Qwik-Fence welded wire partitions install 25% faster by employing fewer parts and self-tapping screws, instead of the nuts and bolts used in conventional systems. Doors are pre-hung, cutting installation time in half. Economical – Qwik-Fence welded wire partitions offer the lowest total cost of ownership of any wire partition system on the market. Strong, secure – Qwik-Fence welded wire partitions get their strength from the 8-gauge welded wire mesh, all-steel construction, floor anchoring system, and thick-wall square tubing posts. Panel hardware is accessible only from the inside of partition for added security. Maintenance-free – Qwik-Fence welded wire partitions look new for years to come. Galvanized components are maintenance-free. Multiple applications – Qwik-Fence welded wire partitions are ideal for separating and securing any space in industrial, commercial, or government environments. 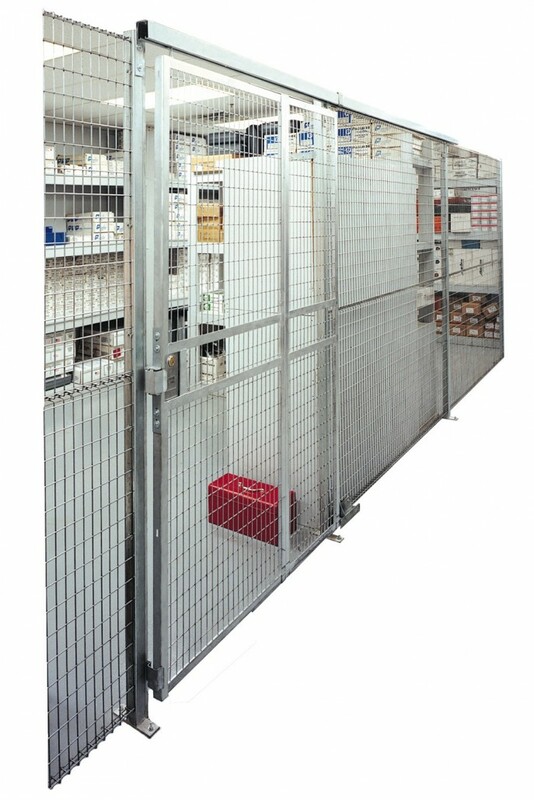 Qwik-Fence can be used to divide work areas and create secure storage in stock rooms and tool cribs. Modular – panels stack on top of each other between posts to create enclosures up to a height of 75 feet. Attractive – bright, steel wire mesh gives it a clean, attractive look in both office and production areas. Powder coated colors are optional. Superior Support can supply shop drawings, help determine layouts, and install your security or storage partitions. Ask us about our timely delivery and in-stock items! Copyright © Superior Script | Designed by G4 Design House.